Stephen Curry will teach an online basketball class as part of his new partnership with MasterClass. The curriculum will focus on the fundamentals and is designed for beginning and intermediate players. The class is set to get started in early 2018. It costs $US90 to enroll. Thousands of young NBA fans across the country have grown up wanting to be just like the Golden State Warriors guard Stephen Curry, and now they can take a basketball class from the man himself. 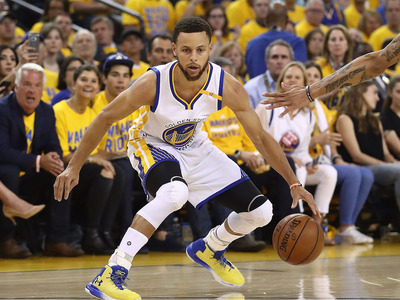 Curry will teach the class as part of his new partnership with MasterClass, an online educational platform that offers tips and advice from industry leaders in all kinds of work. The website’s current roster of teachers includes names like Serena Williams, Steve Martin, and Gordon Ramsay. Classes are taught via a series of videos. Curry’s curriculum will focus on the fundamentals of basketball, complete with drill walk-throughs and Q&A sessions. The class is priced at $US90 for more than 15 lessons and is currently open for pre-enrollment. It’s set to begin early next year. The venture will certainly generate some buzz among NBA fans. Curry had the top-selling jersey in the league last season and is regarded as one of the foremost three-point shooters in history, ranking ninth on the all-time list at just 29 years old. The two-time MVP’s tips should entice a wide variety of fans, from middle school ballers with travel team aspirations to weekend-leaguers at the YMCA. Curry said that while the tips will be helpful to those enrolled, he will also benefit from teaching the lessons. The courses will feature “step-by-step tutelage on ballhandling, shooting techniques, the creation of offence, playing ball screens, proper balancing and finishing on either side of the rim, to name of few,” according to Chris Haynes of ESPN. However, there is one skill that Curry won’t cover. For fans who don’t want to shell out $US90, there’s plenty to be learned from watching Curry on a nightly basis. The Warriors will play their next game on Thursday against the Boston Celtics.